The sample size in Bicycling magazine’s survey of U.S. retail bicycle stores was influenced by statistical considerations, The allowance for sampling error was limited to 5 percentage points, The table that follows was used to determine the allowances that should be made for sampling error, The computed confidence intervals took into account the effect of the sample design on sampling error, These intervals indicate the range within which the results of repeated samplings in the same time period could be expected to vary, 95 percent of the time, assuming that the sample procedure, survey execution, and questionnaire used were the same. 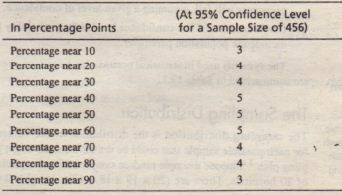 The table should be used as follows: If a reported percentage is 43, look at the row labeled “percentages near 40.” The number in this row is 5, which means that the 43 percent obtained in the sample is subject to a sampling error of plus or minus 5 percentage points, Another way of saying this is that very probably (95 times out of 100) the average of repeated samplings would be somewhere between 38 percent and 48 percent, with the most likely figure being 43 percent, A 2009 survey conducted by Bicycling magazine to gauge readers’ interests made use of this table for estimating sampling errors. Marketing research firms are now turning to the Web to conduct online research, Some leading market research companies (AS I Market Research. GfI< Custom Research. Inc and M/A/R/C Research) partnered with Digital Marketing Services (OMS). Dallas. to conduct custom research on AOL. OMS and AOL will conduct online surveys on AOL’s Opinion Place with an average base of 1.000 respondents by survey, This sample size was determined based on statistical considerations as well as sample sizes used in similar research conducted by traditional methods, AOL will give reward points (that can be traded in for prizes) to respondents. Users will not have to submit their e-mail >addresses, The surveys will help measure the response to advertisers’ online campaigns. The primary objective of these research projects is to gauge consumers’ attitudes and other subjective information that can help media buyers plan their campaigns, Another advantage of online surveys is that you are sure to reach your target (sample control), and that they are quicker to turn around than traditional surveys such as mall intercepts or home interviews, They also are cheaper (OMS charges 520,000 for an online survey. whereas it com between $30,000 and $40,000 to conduct a mall-intercept survey of 1,000 respondents) To grasp the statistical aspects of sampling, it is important to understand certain basic definitions and symbols. 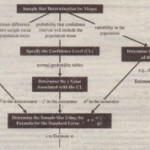 Confidence intervals and other statistical concepts that play a central role in sample size determination are defined in the following list. Parameter: A parameter is a summary description of a fixed characteristic or measure of the target population. A parameter denotes the true value that would be obtained if a census rather than a sample were undertaken. Statistic: A statistic is a summary description of a characteristic or measure of the sample, The sample statistic is used as an estimate of the population parameter. Finite population correction: The finite population correction (fpc) is a correction for overestimation of the variance of a population parameter, for example. a mean or proportion, when the sample size is 10 percent or more of the population size. Precision level: When estimating a population parameter by using a sample statistic, the precision level is the desired size of the estimating interval. This is the maximum permissible difference between the sample statistic and the population parameter. Confidence interval: The confidence interval is the range into which the true population parameter will fall. assuming a given level of confidence. Confidence level: The confidence level is the probability that a confidence interval will include the population parameter. 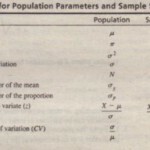 The symbols used in statistical notation for describing population and sample characteristics are summarized in Table 12.1.